Note: This is the bound book only and does not include access to MyLab™ Counseling with Pearson eText. 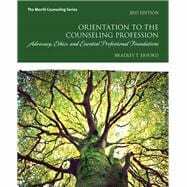 To order MyLab Counseling with Pearson eText packaged with the bound book, use ISBN 0134387422. This title is also available with MyLab Counseling–an online homework, tutorial, and assessment program designed to work with the text to engage students and improve results. Within its structured environment, students see key concepts demonstrated through video clips, practice what they learn, test their understanding, and receive feedback to guide their learning and ensure they master key learning outcomes. Bradley T Erford, Ph.D., LCPC, NCC, is a professor in the school counseling program at Loyola University with primary teaching responsibilities in assessment, research, and lifespan development. He has held numerous professional leadership positions, including past president of the American Counseling Association, and published numerous books, articles and book chapters.